It’s always a risk for anyone to make a movie that makes you think. Why? Because it takes a lot of creative writing to construct a vision that you come up with that also connects with a wider audience. That’s why there are a lot of movies that technically have an interesting concept, but don’t go over so well with the critics. The Purge, for example, has a lot of important and ethical questions for our society. However, it wasn’t accepted very well from its reviews…and I understand that…but I also stick up for the bullied movies and give credit where credit is due. Transcendence is another movie that really tries to make you think about where we’re heading in society…it’s just the way it tries to get there that’s questionable. So, Johnny Depp basically plays a genius scientist by the name of Will Caster. Will’s vision as a scientist is basically to create a god-like artificial intelligence, which of course, is upsetting the “playing god” enthusiasts. One of these radicals shoots Will, which somehow poisons Will’s systems…giving him only a month to live. His wife, Evelyn, decides to continue his work and upload his consciousness to the internet…a form of immortality if you will. The question arises, however, if Cyber-Will is really Will at all when his uploaded consciousness begins to rapidly change the world in virtually supernatural ways. It’s not really hard to see that this movie is all about the implications of playing God and the positives and negatives of such an act. We’ve had these movies before in different forms, but I personally like the lone idea of our consciousness being uploaded onto the internet. After all, our brain is just a system of wirings and synapses…it’s just a complicated computer anyways…so the idea alone isn’t absolutely horrible. The main problem this movie faces is that the idea is strong, but where to go after you obtain the idea…is grasping. After he’s on the internet, there are a few things that he does that just doesn’t make any sense whatsoever. The explanation is cool. The visuals are cool, but the idea is so far-fetched that it jumped too far into the realm of sci-fi that it couldn’t easily get back. It’s not that the direction was horrible, but it definitely wasn’t expected, and certainly not what I wanted to see from the film. I love movies that make you think, and the advancements of our technology is absolutely stunning in real life…it really does make you think if some things are possible. It should have just stuck with that. In fact, the actual uploading of the consciousness shouldn’t have even happened until the end or something…and the movie would just be a journey of explaining science and discoveries. It could be very thought-provoking if it tried to be. Instead, it tried way too hard and overreached its potential. I did have fun with the movie, though. Yes, there were moments where I sighed and rolled my eyes, but I was in it and wanted to see how they would end everything. It could have been something amazing, but it just turned out to be something bearable and cool to see if you have nothing else to do on a Tuesday evening. I also liked the selection for the cast and enjoyed seeing them on screen even if this wasn’t their best movie…any of them. Despite all of its flaws, Transcendence makes you think about the advancements of technology and where we’re really heading to in the future. 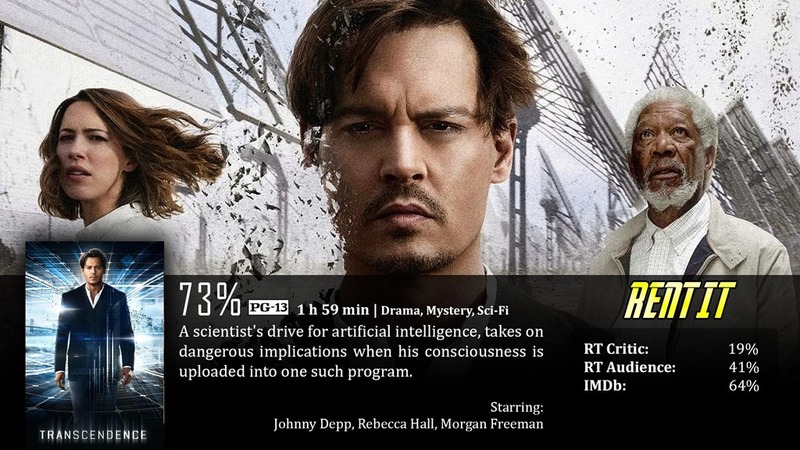 Johnny Depp tried his best to perform as a self-aware computer system, but understandably came off a bit robotic. To be blunt, it overreached its potential. It had a good idea, and then it took that idea and stretched it to unbearable lengths. It went from being really interesting to overly sci-fi in a matter of minutes – transforming into something you never really cared to see from the movie to begin with. Cillian Murphy was in this movie, and his character was surprisingly boring and uninvolved.